Dallying In The Dirt, Issue #258--- The wonderful Tulip display portends Rhubarb Pie. This really is my garden’s best time of year. I do love my Iris but they can’t compare to the Tulips for a traffic stopping show. Looking closely at them I notice that some of the older varieties are no longer with us. 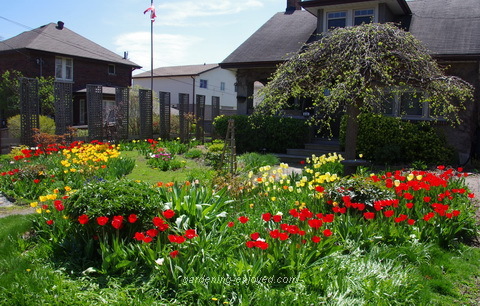 Many of the Tulips last for several years and a few have been there for a long time. The problem is, their native land. Tulips are native to parts of the world that have great spring weather but then get quite hot and dry through the summer. When we plant them in mixed beds as they are here, the soil stays relatively cool and moist throughout the summer. We sometimes water these beds and all of the other perennials help to shade it and stop the sun from baking the Tulip bulbs. Every 2 or 3 years I notice that the show is diminishing and I get ambitious and plant another 500 or so. It’s my estimate that through the course of the Tulip season there should be about 1000 blooms appear. I plant early, mid and late season varieties to extend the show and that keeps it constantly changing over the 4 - 6 weeks that it lasts. I spend as much time as I can just admiring the front yard and that helps me forget the effort that it took to plant those several hundred bulbs. It’s always worth it and the dozens of people who come by to admire it seem to think so as well. Back in the vegetable garden we continue to plant as the weather becomes more conducive. A few of the Earthboxes have now been planted with the cool season crops and I’ve done two with Beans. Actually I did one Earthbox with Beans for the first time and one ordinary planter with the same beans to compare the results. 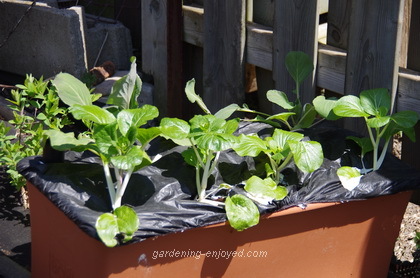 This is the first time I have tried growing anything from seed in the Earthboxes and I planted some Beet seeds in another to see how they perform. The more things I can successfully grow in these reservoir containers the happier I’ll be. No weeds, rabbits don’t seem to like to eat from them and I don’t have to bend quite so far to work with them, although they do need to have their water topped up quite regularly. They use an amazing amount of water mid summer when they are filled with large plants. I have a plastic tote in the basement that I’m going to use, to try and make a home made version, to see if it works and if I can make it significantly cheaper than the purchase and shipping price. 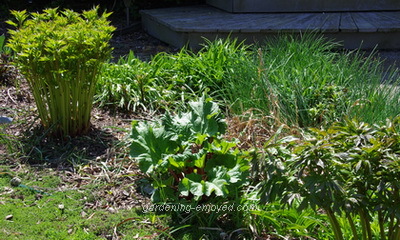 Out in the front yard between two lovely Peonies, is the raw material for my favourite breakfast, Rhubarb pie. I moved it out there last year so that it could escape the shade that it was trying to grow in. I didn’t originally plant it in the shade but the columnar Yew that I placed beside it had grown tall enough to block its sun. It struggled along last year but has come bursting out of the soil this spring and looks ready to surrender itself to the pastry anytime soon. I have pointed out, to the Assistant Gardener, how well it has been growing in its new location. I thought I saw her making pastry the other day so maybe my, less than subtle, hints are having the desired effect. I decided to put it in a rather prominent part of the front yard because it is actually quite a decorative perennial with the large leaves on top of the bright red stalks. I love it when food plants are also very decorative. It helps with my campaign to get people to reduce the amount of grass they are growing and to increase their home garden food production. Susan Asks? Thanks for a wonderful newsletter! Any suggestions regarding how to get rid of the horrible red lily bugs. I have pinched them and tried insecticide soap to no avail. I read that Dimethoate may work but since I do not use any chemicals, I am concerned. Thank you! Ken Answers! We have no chemicals available in Canada and I probably wouldn't use them anyway. It's all mechanical. I carry a pair of needle nosed pliers in my back pocket and reach between the leaves to grab them. Once they get picked out of the leaves they provide a very satisfying "crunch" as I dispatch them. I never get them all so I keep a lookout for the rows of little orange eggs on the underside of the leaves and just wipe them off. Here’s some more information.